Today more and more companies are embracing the principles of on demand business by integrating business processes end-to-end across the company and with key partners, enabling them to respond flexibly and rapidly to new circumstances. The move to an on demand business environment requires technical transformation, moving the focus from discrete applications to connected, interdependent information technology components. Open standards such as Web services enable these components to be hosted in the environments most appropriate to their requirements, while still being able to interact easily, independent of hardware, run-time environment, and programming language. The Web services support in CICS® Transaction Server Version 3 enables your CICS programs to be Web service providers and requesters. CICS supports a number of specifications including SOAP Version 1.1 and Version 1.2, and Web services distributed transactions (WS-Atomic Transaction). 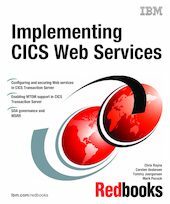 This IBM® Redbooks publication describes how to configure CICS Web services support for HTTP-based and WebSphere® MQ-based solutions, and demonstrates how Web services can be used to integrate J2EE™ applications running in WebSphere Application Server with COBOL programs running in CICS. The book begins with an overview of Web services standards and the Web services support provided by CICS TS V3. Complete details for configuring CICS Web services using both HTTP and WebSphere MQ are provided next. We concentrate on the implementation specifics such as security, transactions, and availability.